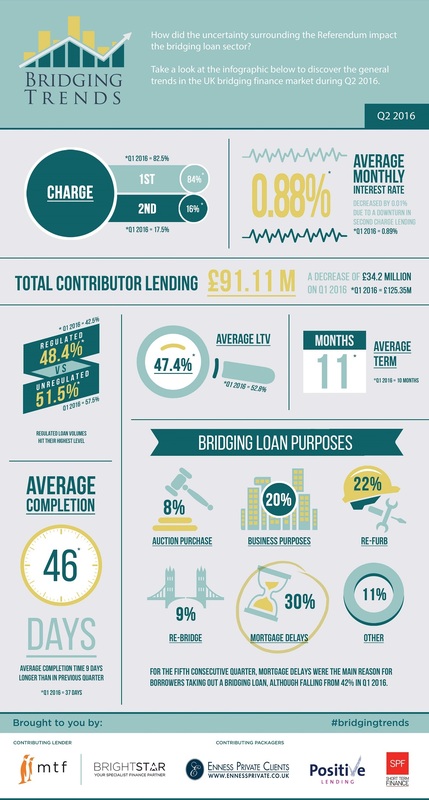 Take a look at the infographic below to see the trends that shaped the bridging finance market in Q2 2016. “Uncertainty in the run up to the Referendum seems to have contributed to a cooling off of the market. However, though there was a drop in lending volumes in Q2, the latest data has in fact shown a degree of consistency with the same quarter last year, where lending volumes were only 8% higher at £99.11 million. “I was surprised to see the average completion time increase again to 46 days. Lenders may need a reminder of the old marketing slogan ‘If it’s not done in 2 weeks it’s just not bridging!’ To be fair, this could be down to short-term funders providing facilities for development which is admittedly a longer process. “It is no surprise that bridging lending was down for Q2 in the lead up to the referendum, with the fall-out of MCD, stamp-duty changes to BTL and of course, the shock Brexit result.